The MayDay Parade starts at the corner of 25th St. E and Bloomington Ave. S at 12:00 noon, and travels south on Bloomington to 34th St. E and into Powderhorn Park. 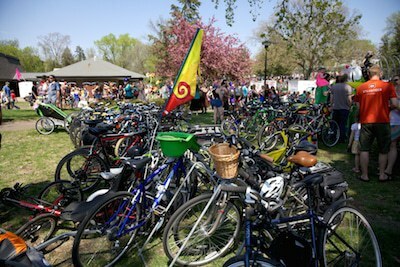 The MayDay Festival takes place in Powderhorn Park, located in the heart of the Powderhorn neighborhood in South Minneapolis. The MayDay Ceremony starts at 3pm in Powderhorn Park. Plan your trip to MayDay on Metro Transit at www.metrotransit.org. Route 14 on Bloomington Ave.
Route 21 on Lake St. Parking is limited to street parking or public lots near the parade route or Powderhorn Park. There is no designated parking for either the parade or festival. We highly recommend taking advantage of walking/biking if possible. Powderhorn Park is located in the middle of a dense, residential neighborhood. Please park legally and respectfully. Thank you! Live nearby? Skip or hop or stroll or roll or walk or run to MayDay! Have friends or family who live nearby? Park your car and skip or hop or stroll or roll or walk or run to MayDay together! The Minneapolis Bike Coalition will again be providing bike parking in Powderhorn Park (near the park building at 3400 15th Ave. S). Just visiting? Don’t own a bike? Try Nice Ride! There’s a Nice Ride station located at the Midtown Global Market (on 10th Ave. S at the corner of Lake St. & 10th Ave. S). HOBT is committed to making MayDay accessible for everyone. Please check the 2016 MayDay Festival Map & Schedule for the location of ADA-accessible restrooms, disability parking (in the lot of Powderhorn Park), and wheelchair seating for the MayDay Ceremony. Questions? Please email [email protected] or call 612-721-2535. We’ll see you there!